Gavrilo Princip’s killing of Austria-Hungary’s archduke Franz Ferdinand is perhaps one of history’s best known assassinations. It catalysed the political, bureaucratic and martial wranglings that led to World War I. The gun Princip used to kill Ferdinand — an FN-Browning M1910 — is therefore one of history’s most significant weapons. For centuries Bosnia had been a Turkish territory. The Ottoman Empire receded during the latter half of the 19th century and, in 1908, the Austro-Hungarian Empire formally annexed the region after occupying it for several decades. Bosnia was just one of the many regions that made up the heterogeneous Austro-Hungarian Empire. In June 1914, elements of the Austro-Hungarian Army were scheduled to carry out maneuvers near Sarajevo, the regional capital. Emperor Franz Josef had ordered that Archduke Franz Ferdinand, the heir to the dual crown of the Austro-Hungarian Empire, would observe the exercise. The archduke’s itinerary included meetings, dinners and the opening of a museum. On June 28, 1914, Ferdinand and his wife Sophie arrived in Sarajevo by train. Escorted by the region’s governor, the royal party took a convoy of cars to the town hall, stopping only for a brief inspection of some local barracks. The route of the royal procession was public. Crowds gathered. Among them were Serbian assassins from Young Bosnia, an anti-Austrian revolutionary group supported by the Black Hand, a Serbian paramilitary force. Ferdinand was well-regarded by many of the people of the Austro-Hungarian Empire. He was seen as a moderate. A reformer. One of his stated hopes was to combine the Slavic regions of the empire into a third crown-state. Serb radicals who saw this as another impediment to Serbia’s influence in the region. The Black Hand had provided the assassins with training as well as six grenades, four FN-Browning automatic pistols and a map of the motorcade’s route through Sarajevo marked with the likely positions of police and security. The six assassins found positions along the route. But as the archduke’s car passed, the first two assassins failed to act. At around 10:15 in the morning, the third assassin Nedeljko Čabrinović did act. He threw his hand grenade at the archduke’s car. It struck the car’s folded roof, glanced off and exploded beneath the car behind, injuring more than a dozen people. Čabrinović then took a cyanide capsule and jumped into the Miljacka River which ran parallel to the road. The cyanide had lost its potency and failed to kill Čabrinović. The Miljacka was particularly low due to drought and Čabrinović was quickly apprehended. The remaining assassins were unable to intervene as the archduke’s car sped for the town hall. Despite the assassination attempt, little was done to increase the security protecting the archduke — and the reception at the town hall went ahead as planned. The rest of the day’s program was cancelled, however, and it was decided that the royal couple would visit those injured in the bomb attack. At approximately 10:45, the motorcade set off for the city’s hospital. The driver hadn’t been advised of a change of route and inadvertently turned right onto Franz Josef Strasse rather than back down Appel Quay. The driver was advised of the change of plans and began to turn around outside Schiller’s Delicatessen opposite the Latin Bridge. At this moment, Princip stepped forward and opened fire with his M1910. Princip was a 19-year-old Bosnian Serb. He’d attended a merchant’s school in Sarajevo for several years before being expelled for taking part in anti-Austrian demonstrations. In 1914, he’d been recruited into Young Bosnia by Danilo Ilić. 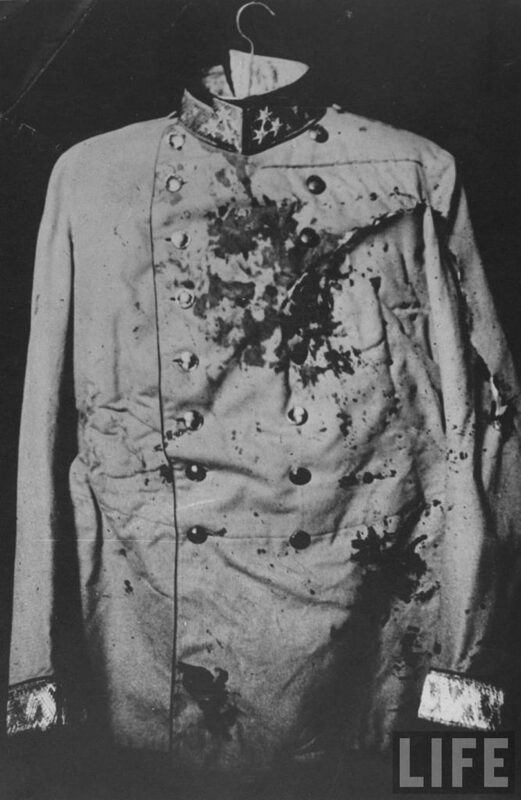 Princip’s first .380 ACP round entered the archduke’s neck, piercing his jugular and lodging in his spine. Considering how difficult to use the Model 1910’s sights are, Princip was either extremely lucky to hit the archduke — or was a skilled snap-shooter. After shooting Ferdinand, Princip attempted to shoot Oskar Potiorek, the Austrian governor of Sarajevo, who was sitting in the front passenger seat of the archduke’s car. But as he fired, police and members of the public leaped on Princip. His shot struck Sophie in the abdomen. She slid off her seat next to the stricken archduke. His bodyguard asked how he felt. “It is nothing,” Ferdinand said — then died. Beset by the crowd, Princip took his cyanide pill. But like Čabrinović’s own pill, it failed to kill him. The police arrested Princip. 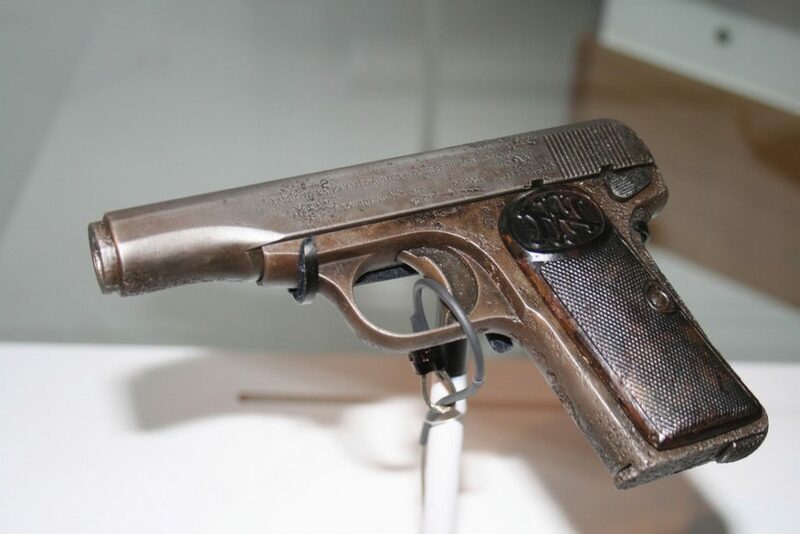 Princip’s M1910 pistol was chambered in the nine-by-17-millimeter .380 ACP round. The .380 ACP cartridge is light and compact, ideal for pocket pistols. And while its stopping power may be less than that of a full-size nine-millimeter Parabellum round at short ranges, it has adequate penetrating power. And the projectile can mushroom and flatten to almost 16 millimeters — almost twice its fired diameter — once it strikes a target. The Model 1910 was designed by John Browning and manufactured by Fabrique Nationale d’Herstal of Belgium. It entered full production in 1912. The M1910 had a four-inch barrel but was just under seven inches long, overall. It fed from a six-round, single-stack box magazine and had magazine, grip and thumb safeties. FN eventually produced some 572,590 M1910s. Immediately following the assassination, the Austro-Hungarian Empire launched a pogrom against the Serbs of Sarajevo. Around 5,000 Serbs were arrested. Nearly 1,000 died. In Vienna the assassination was met by a combination of horror and what might almost be described as relief. Ferdinand’s reforms had never been particularly popular with Emperor Franz Josef. But Austria’s closest ally Germany saw the assassination as an opportunity. Germany pushed Austria into issuing an ultimatum to Serbia in the knowledge that this might provoke war with Russia, Serbia’s ally. For Austria the assassination became little more than a pretext to settle old scores in the Balkans and expand Austrian territory. But Austria’s declaration of war on Serbia on July 28, 1914, eventually had the domino effect that Germany had anticipated. Before long, all of Europe was at war. The assassins themselves were almost all captured within weeks. Their trial took place in October 1914, three months into World War I. Despite many of the defendants testifying that they acted independently of Serbia, the court ruled that the Serbian government was complicit. Most of the defendants were found guilt. Three hanged. 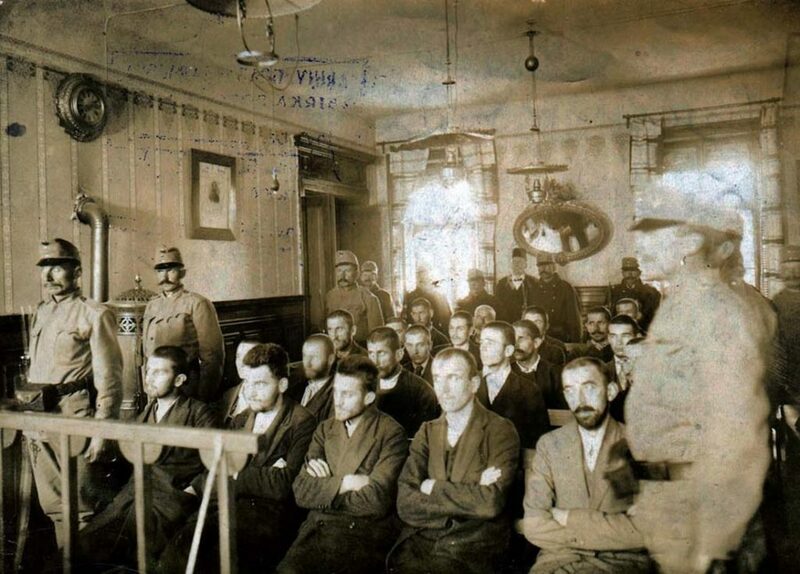 Čabrinović and Princip could only be sentenced to 20 year in prison, the maximum prison term for defendants under the age of 20 at the time of their crime. However, both men would later die of tuberculosis while in prison. 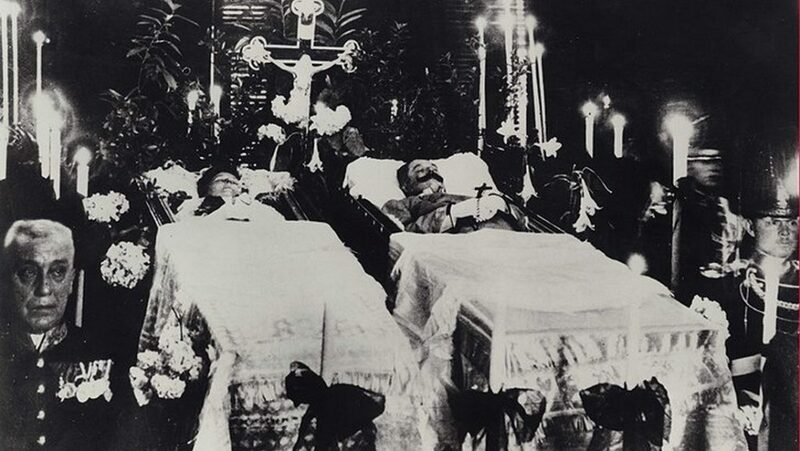 Once Princip had been apprehended, his pistol was, for unknown reasons, given to the Jesuit priest who administered the last rites to Ferdinand and his wife. The Jesuits eventually turned over the gun to the Vienna Museum of Military History.